Jazz is woven through the fabric of New Orleans, so it is not surprising that there were members of the Jewish community involved in that American musical form. The Jewish Children’s Regional Service will celebrate that history with “The Jewish Roots of Jazz,” a gala event at the Ogden Museum on March 17. The event is part of the organization’s annual meeting weekend; the business sessions will be March 18. Noted author and jazz musician Thomas Sancton will narrate an 8:30 p.m. program that features the Preservation Hall Jazz Band. Sancton’s 2006 memoir, “Song For My Fathers,” detailed his apprenticeship with the Preservation Hall Jazz Band as a teen in the 1960s. He worked in Paris for Time magazine for two decades before returning to New Orleans after Hurricane Katrina. In 2007 he became a professor in humanities at Tulane. On Jan. 7, he was a guest performer at Carnegie Hall in New York for the Preservation Hall Jazz Band’s 50th anniversary concert. Ned Goldberg, director of JCRS, said now is the appropriate time for the agency to celebrate Jews in jazz, because current board president Bruce Miller is a third or fourth generation musician. 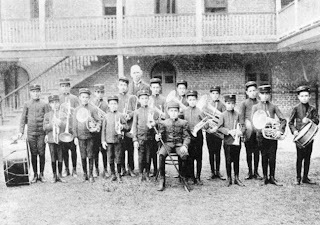 A recipient of JCRS camp aid when he was growing up, Miller’s uncles had been part of a band in the New Orleans Jewish Children’s Home, depicted here. 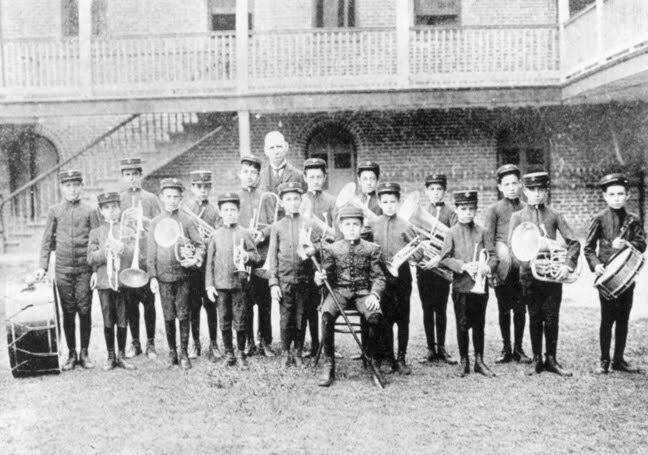 The photo of the Jewish Children’s Home Band is from around 1903. Miller’s uncles, the Korn brothers, and Mike Caplan were among eight New Orleanians from the early 20th century listed in the recent book “Jazz Jews.” The book also notes that the trombonist for the Original Dixieland Jazz Band stated the best jazz band that preceded them was Achilles Baquet, which had three Jewish members, including Caplan. Goldberg said he is working on a keepsake booklet for the event that will detail Jewish New Orleans jazz history, while Sancton will have a more national perspective in his presentations. Another individual in the 1903 photo is Louis Yarrut, who later became a well-known judge. Yarrut also became president of the home, and his grandchildren are active with JCRS. Around 1990, the late Kohlman Stabinsky, a New Orleans brass player, told Goldberg that his father, Julius, was in the photo, and that many graduates from the home played in the New Orleans Symphony. A major piece of New Orleans jazz history is Preservation Hall. The famous venue was formed in 1961 by Pennsylvanians Allan and Sandra Jaffe, who decided to return to Louisiana after a military career that had originally brought them to the state. They opened following the dissolution of the Society for the Preservation of Traditional Jazz, providing a venue for black artists that were being overlooked in an era of segregation. The Jaffes were interested in preserving what was then a disappearing art form. Ben, their son, now manages the venue, which has live sets every night starting at 8 p.m. He also manages the band, which started touring in 1963, promoting New Orleans music throughout the world. Terry Teachout, who wrote a recent biography of Armstrong, said Armstrong admired how Jews overcame prejudice by banding together and working, instead of wanting pity. Teachout said Armstrong’s views on self-help came from his experience with Jews, and he wore a Star of David pendant throughout his life. Another piece of New Orleans Jewish music history is “A Kiss Goodnight,” recorded by Ella Fitzgerald, among others. The song was written by Victor Kirschman and Reba Nell Herman, with Freddie Slack. The Herman family continues to be musically inclined, and many of Reba Herman’s children went on to become attorneys, with the Herman, Herman, Katz and Cotlar firm. Kirschman’s family ran Kirschman’s Furniture Stores. The evening will be a benefit for JCRS. Goldberg said this is only the second full-blown event of this kind that JCRS has done in the last two decades. JCRS is the oldest existing Jewish children’s social services organization in America. It coordinates need-based scholarships to Jewish summer camps, college assistance and assistance for isolated or special-needs children. It also coordinates the PJ Library, a project that sends free Judaica books to children every month. The agency serves a seven-state area, including Alabama, Louisiana, Mississippi, Arkansas, Tennessee, Texas and Oklahoma, the old B’nai B’rith District 7. The agency started in 1855 in New Orleans as The Association for the Relief of Widows and Orphans, eventually becoming known as the Jewish Children’s Home. The Isidore Newman School started as a spin-off of the orphanage. The home closed in 1946, and the organization transformed into JCRS. A patron’s party at 6 p.m. will honor the Berenson family — siblings Sara Berenson Stone, Byrde Berenson Haspel and Dr. Gerald Berenson. Natives of Bogalusa, they all moved to New Orleans as young adults and have been involved in a wide range of Jewish and general community causes. Goldberg said Stone is “the person most responsible for there being a JCRS since the 1950s,” advocating to so many people on behalf of the agency. The siblings have six scholarship funds set up at JCRS. David Torkanowsky and the Clarinet Choir of the New Orleans Concert Band will perform at the patron’s party. Torkanowsky is a jazz pianist in New Orleans, son of the late Werner Torkanowsky, who was conductor of the New Orleans Philharmonic. Chef Alon Shaya of Domenica, one of the four New Orleans chefs who traveled to Rosh Ha’Ayin last summer, is catering the patron’s party. Specialty cocktails will come from Cure/Belloco. Maple Street Patisserie is doing desserts at the reception following the concert. Individual concert tickets are $75, while patron tickets are $200 each, with many sponsorship levels available. Advance reservations are strongly recommended, as the individual concert tickets may sell out prior to the event.